What news is Apprenda announcing today? Apprenda and Microsoft announced today that we’re changing the game in the way customers think about and acquire cloud. We believe that the end-state is hybrid cloud, and today we’re announcing an end-to-end hybrid cloud solution for .NET and Java applications. 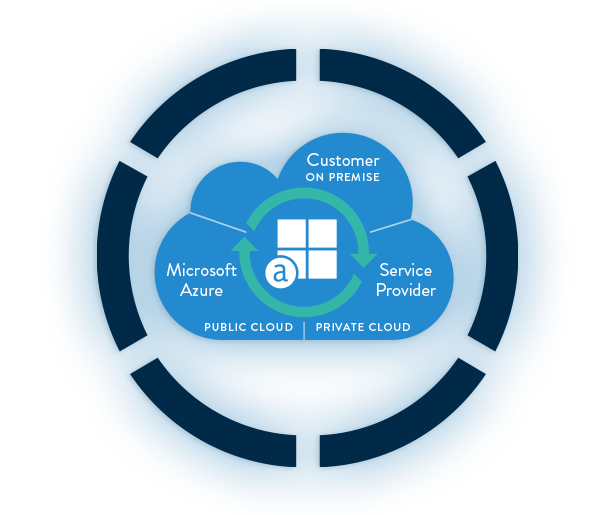 Customers who license Apprenda will now have a turnkey hybrid implementation that includes Azure infrastructure out-of-the-box at no additional cost, ensuring that enterprises can seamlessly leverage public cloud as a feature of their datacenter from day one. Why is this significant to Apprenda’s enterprise customers? We believe that cloud adoption is a journey, not a destination. With our “OneCloud” solution, customers can consume the public cloud as a part of their overall hybrid cloud strategy. As industry and customer demands continue to pave the way for widespread cloud adoption, Apprenda aims to eliminate the need to choose between the public and private cloud and empower enterprises to run on both. Why is this significant to Microsoft’s enterprise customers? Microsoft customers have invested heavily in the Microsoft stack as a core component of their datacenter. Apprenda helps extend that investment to Azure, ensuring that their on-premises resources can be easily merged with Azure IaaS, providing an easy way for moving applications back and forth. The result is that those on-premises cloud investments become perfectly aligned and operated by the enterprise as a seamless environment, removing all the friction related to the boundary between private and public. How will this partnership enable hybrid cloud? We found a way where we can drive both of our solutions. It’s an overall triple win: it’s a win for Microsoft, a win for Apprenda, and a win for our customers. The new partnership will support a smooth transition for enterprises adopting a hybrid cloud environment and provide Apprenda and Microsoft customers the flexibility to run and manage their cloud environments in effective and cost-efficient ways. What are the top two most important takeaways from this announcement? Apprenda’s deepened relationship with Microsoft will benefit enterprises. The combination of Apprenda and Microsoft Azure enables customers to meet stringent security requirements, while achieving reduced operational costs, improved performance, and the desired hybrid cloud end-state. The future of cloud is a hybrid approach. To further enable this, this joint offering was developed to help our customers leverage hybrid cloud environments easily and without compromise. How does this offer compare to competitors’ offerings? Cloud companies often collaborate to offer hybrid cloud services. Through this partnership, Apprenda and Microsoft are leading larger enterprises toward adoption of a hybrid cloud model. No other offering on the market provides a turnkey, policy driven, hybrid cloud application platform such as this joint solution. No other offering ensures that each dollar an enterprise invests in cloud moves the needle forward in both their private and public strategy. How does this compare to Microsoft’s existing Hyper-V hybrid capabilities? Hyper-V images can move seamlessly back and forth between the datacenter and Azure, but Azure PaaS does not exist in the datacenter. Apprenda provides a hybrid PaaS solution that provides enterprises a true hybrid application platform in addition to Hyper-V’s existing hybrid capabilities.